After the tragic avalanche on 18 April, Mt Everest has been functionally closed. By 1 May 2014, all large expeditions had cancelled their climbs, and were heading home. But two climbers have disregarded the unofficial decision to abandon the Everest season and continued climbing last week. On 18 May 2014 they were reported to be at Camp 2 or higher. American Cleo Weidlich and Chinese climber Jing Wang are the two climbers reportedly continuing to ascend. Mountaineer Alan Arnette continues to provide up to date information on this latest development, as he did of the teams earlier in this trying season, and almost every Everest season for the past 10 years. Arnette reported the ladders from the Khumbu Icefall were being removed on 8 May 2014 by high altitude workers. On 18 May he updated his report that the ladders had not been removed, but were instead not being actively maintained. 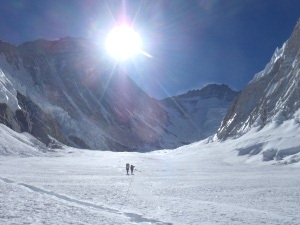 Jon Miller, creator of the Rest of Everest video podcast, confirmed on 18 May 2014 that Cleo Weidlich, 51, is currently at Camp 3 preparing to climb the Lhotse face, the fourth highest peak in the world. Two high altitude workers are with her. Weidlich said on her Facebook page she was not going to wait for the standoff between the high altitude workers, government, and trekking agencies to resolve itself over the next year. My climb on the Everest Massif will continue with or without ladders. I have climbed some of the world’s most dangerous mountain WITHOUT them. [. . .] I refuse to give in to the pressures of the Everest mafia. I’d like to decide for myself when I have reached my limits. It appears that Jing has arranged to continue to climb with another agency and has without permission flown by helicopter to Camp 2, despite me warning her not to. The Civil Aviation Authority of Nepal, The Ministry of Tourism and Aviation Authorty, and Lukla airports all denied any knowledge of the flights at the time. Helicopters need permission to ascend higher than Everest Base Camp. They were investigating Brice for the helicoptered flights, but as of 19 May 2014 Brice was cleared of responsibility. Cleo Weidlich also was flown by helicopter, from Gorak Shep to Camp 2, according to Arnette’s blog. The continuing expeditions on the North side of Everest are currently aiming for a summit push in the window of 23-26 May 2014 as Arnette updated. Mount Everest climing is one of the most difficult and thrilling climb in the world.